America can’t pay the rent. A 2017 report from the US Department of Housing and Urban Development (HUD) found that 8.3 million very low-income households paid more than half of their monthly income on rent, or lived in substandard housing. This proportion has risen by 66 percent since 2001 and 41 percent since 2008. The median price of monthly rent for a 1-bedroom apartment in the United states is $1,040 as of January, 2018. 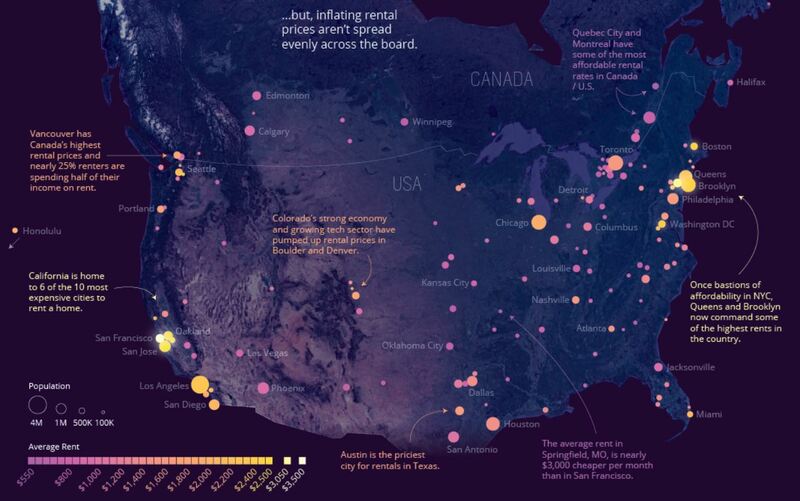 This map from Visual Capitalist shows the cities in which average rent prices are highest – and lowest – in North America. Rents are rising quickly in many expected markets, like Seattle and Sacramento. 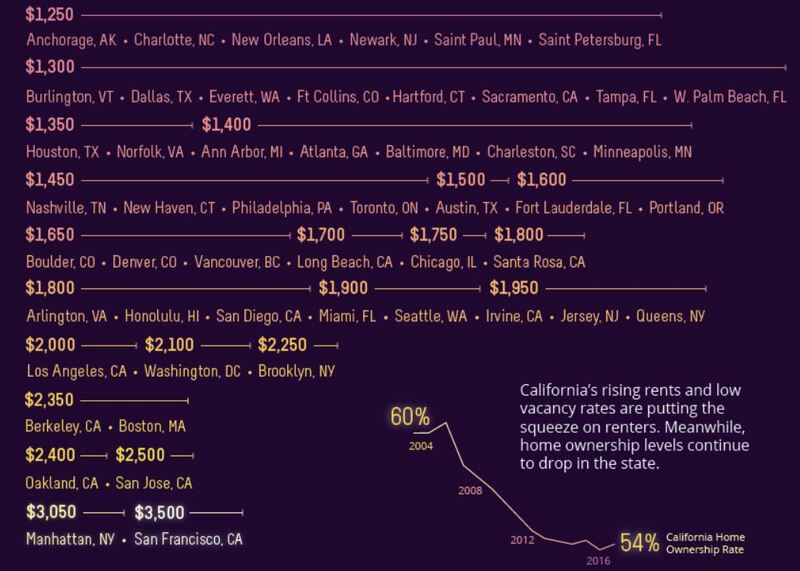 However, rent prices are also going up in unexpected areas, such as Minneapolis and Atlanta. There’s no where in the United States where a person making minimum wage can afford a standard 2-bedroom apartment. According to the map, Quebec City and Springfield, Missouri have the lowest average rent of the selected cities at around $550/month. Other cities in Quebec and Ohio take some of the lowest spots. Overall, Canada, the South, and Midwest boast the lowest average rents, with Austin, Chicago, and Nashville being the most obvious standouts in the $1,400 – $1,700 range. On the other end of the spectrum, Manhattan and San Francisco, predictably, take the top spots, with the other New York City boroughs and Silicon Valley hubs coming in close behind. Most of the major U.S. cities fall within the $1,500 – $3,500 range, which spells bad news for recent graduates and young professionals who move to these cities for work only to find it difficult to afford housing. But why is the rent so high? One major reason is the housing shortage. With a shortage of affordable homes for new families to buy, fewer people are buying and instead renting longer. The housing shortage is driving up mortgage prices, and with Americans being paid disproportionately low wages, young people are waiting longer and longer to buy, meaning they’re staying in the renter market. Older people who can’t buy continuing to rent, combined with rental demand from young people creates a shortage of rental properties, which then drives up rental prices. Another major cause is a shortage of affordable rental properties in favor of more and more luxury rentals. The construction boom of recent years has mitigated some of the supply problem, but most of these new apartments are luxury buildings, which of course demand a high price. Currently, the financial incentive for developers is to build luxury properties, meaning few new low to moderate income apartments are hitting the rental market. This shortage poses a huge problem for everyone, but especially for low-income and working-class Americans. When even well-paid individuals are forced to take lower quality rentals, it forces out the bottom and leaves many families struggling to find a roof they can afford. Many communities are also concerned about the possible “brain-drain” effect of high rent prices. As young, highly-educated people working in cities begin to settle down and start families, many choose to leave these expensive areas in favor of more affordable real-estate. One solution posed by Susan Popkin, a senior fellow in the Urban Institute’s Metropolitan Housing and Communities Policy Center is to change market incentives and give developers a reason to build low and moderate rental housing. If developers are expected to follow the money, then tax credits and incentives from the federal government might be the only way to get them to build low-income housing. However, there may be a positive consequence to urban centers like New York City, San Francisco, and D.C. becoming more and more expensive. The aforementioned “brain-drain” may lead to the development of smaller cities and towns across the U.S., as young, well-educated people search for work and settle down in more affordable areas. Regardless, many working-class families are suffering from rising rent prices, and may not have the luxury of relocating to one of the few remaining affordable cities. Spending 50% of your income on rent alone is already a reality for a vast number of Americans, and it may only be a matter of time before it becomes the norm.